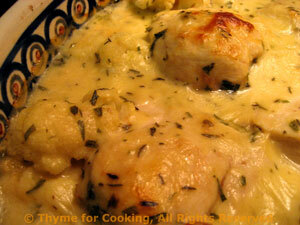 Chicken Breasts Savoyard with Cauliflower, Thyme for Cooking easy gourmet. In nonstick skillet heat oil over medium-high heat. Add onion and sauté until tender, about 10 minutes. Add 1/4 cup white wine, cover and reduce heat to low. Simmer for 10 minutes. Put into a steamer over an inch of water and steam for 10 minutes. Remove from heat and set aside. Add flour and whisk well. Cook flour, whisking, for about 30 seconds. Slowly add wine, then stock, whisking constantly, until thickened. Bring just to a boil, barely. Add yogurt, mustard, herbs and heat through. Stir in cheese and cook, stirring, just until cheese is melted. Remove and keep warm. Get a small baking dish (just large enough to hold everything and, if possible, nice enough to go directly to the table). With a tongs, remove the onions from the skillet and arrange in the middle of the baking dish. Lay the chicken breasts on top and surround with the cauliflower. Pour the sauce over all and bake, uncovered, in 400F (200C) for 20 minutes.